Matthew Bourne has just announced that his emotionally charged, audacious Swan Lake has become the longest running ballet, both in the West End and on Broadway. His reinvention of the Bolshoi’s 19th Century iconic beautiful swans famously replaces traditional ‘beautiful’ female corps de ballet with strong, edgy and irascible male creatures. 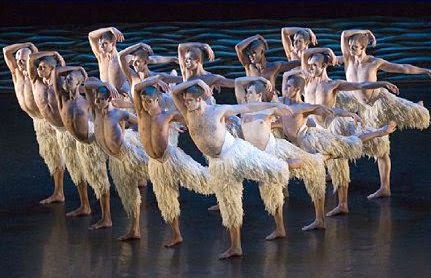 He says ‘…The strength, beauty and enormous wingspan of these creatures suggests to the musculature of a male dancer more readily than a ballerina in her white tutu…’ and indeed his choreography, the swans bouncing with long ‘necks’, perfectly portrays the graceful birds. Chris Trenfield as the spell-binding Swan / psychopathic alter ego leather clad Stranger and Simon Williams as a Prince whose journey of self-discovery is both painful and joyous both dance and acte with such emotion and power that the standing ovation for the company started immediately they re-appeared after the final chords had sounded: the Prince dead on his huge bed, his mother too late feeling something for her son whilst above we see the Dead Swan, killed by his swans, carrying his dead Prince to eternity. Dramatic stuff indeed and incredibly emotional. The 14 corps de ballet male Swans themselves are indispensable and remarkable. Strong, fluid, humorous yet menacing and ultimately cruel and lethal. The 4 baby cygnets take their moment also, witty, nervous, clumsy and fun! Along the way, Bourne’s stylish company bring character, comedy, precision, mime and wit as palace servants, royal officials, asylum nurses and society’s finest; parodying romantic ballet with ornate costumes as butterflies, flowers, woodcutters and insects. Madelaine Brennan is elegance personified as the ice-cold Queen. Carrie Johnson exacted every ounce of comedy as a delightful out-of-her-depth flighty, dim girlfriend/wannabe wag. The award winning set and design by Lez Brotherston is huge and grandiose, enhanced by stunning costumes (so much attention to detail in gloves, accessories, glitz and makeup) and Rick Fisher’s lighting. Swan Lake is the world’s most frequently performed ballet but who would have imagined this production’s tremendous achievement when first performed in London 19 years ago? Judging by the first night full house standing ovation at the Wycombe Swan, it looks set to run for decades more! Runs until 17th May 2014, then tours.